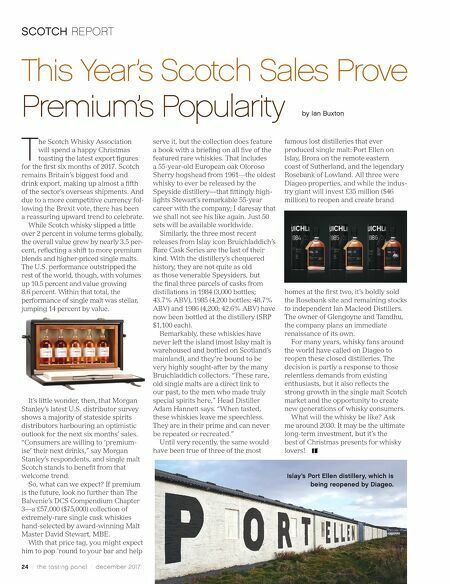 24 / the tasting panel / december 2017 SCOTCH REPORT This Year's Scotch Sales Prove Premium's Popularity by Ian Buxton T he Scotch Whisky Association will spend a happy Christmas toasting the latest export figures for the first six months of 2017. Scotch remains Britain's biggest food and drink export, making up almost a fifth of the sector's overseas shipments. And due to a more competitive currency fol- lowing the Brexit vote, there has been a reassuring upward trend to celebrate. While Scotch whisky slipped a little over 2 percent in volume terms globally, the overall value grew by nearly 3.5 per- cent, reflecting a shift to more premium blends and higher-priced single malts. The U.S. performance outstripped the rest of the world, though, with volumes up 10.5 percent and value growing 8.6 percent. Within that total, the performance of single malt was stellar, jumping 14 percent by value. It's little wonder, then, that Morgan Stanley's latest U.S. distributor survey shows a majority of stateside spirits distributors harbouring an optimistic outlook for the next six months' sales. "Consumers are willing to 'premium- ise' their next drinks," say Morgan Stanley's respondents, and single malt Scotch stands to benefit from that welcome trend. So, what can we expect? If premium is the future, look no further than The Balvenie's DCS Compendium Chapter 3—a £57,000 ($75,000) collection of extremely-rare single cask whiskies hand-selected by award-winning Malt Master David Stewart, MBE. With that price tag, you might expect him to pop 'round to your bar and help serve it, but the collection does feature a book with a briefing on all five of the featured rare whiskies. That includes a 55-year-old European oak Oloroso Sherry hogshead from 1961—the oldest whisky to ever be released by the Speyside distillery—that fittingly high- lights Stewart's remarkable 55-year career with the company; I daresay that we shall not see his like again. Just 50 sets will be available worldwide. Similarly, the three most recent releases from Islay icon Bruichladdich's Rare Cask Series are the last of their kind. With the distillery's chequered history, they are not quite as old as those venerable Speysiders, but the final three parcels of casks from distillations in 1984 (3,000 bottles; 43.7% ABV), 1985 (4,200 bottles; 48.7% ABV) and 1986 (4,200; 42.6% ABV) have now been bottled at the distillery (SRP $1,100 each). Remarkably, these whiskies have never left the island (most Islay malt is warehoused and bottled on Scotland's mainland), and they're bound to be very highly sought-after by the many Bruichladdich collectors. "These rare, old single malts are a direct link to our past, to the men who made truly special spirits here," Head Distiller Adam Hannett says. "When tasted, these whiskies leave me speechless. They are in their prime and can never be repeated or recreated." Until very recently, the same would have been true of three of the most famous lost distilleries that ever produced single malt: Port Ellen on Islay, Brora on the remote eastern coast of Sutherland, and the legendary Rosebank of Lowland. All three were Diageo properties, and while the indus- try giant will invest £35 million ($46 million) to reopen and create brand homes at the first two, it's boldly sold the Rosebank site and remaining stocks to independent Ian Macleod Distillers. The owner of Glengoyne and Tamdhu, the company plans an immediate renaissance of its own. For many years, whisky fans around the world have called on Diageo to reopen these closed distilleries. The decision is partly a response to those relentless demands from existing enthusiasts, but it also reflects the strong growth in the single malt Scotch market and the opportunity to create new generations of whisky consumers. What will the whisky be like? Ask me around 2030. It may be the ultimate long-term investment, but it's the best of Christmas presents for whisky lovers! Islay's Port Ellen distillery, which is being reopened by Diageo.